ALIGN SYSTEMS is making AUTOMATIC BATCHING PLANT in different capacity (100 kg to 50 tons):as per party requirement and party Design. 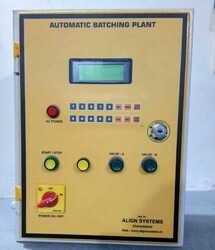 RS232, RS485, motor cut off ( Relay) systems is also provided as per customer applications in this batching plant panel. Automatic Batching plant is also provided with 0 to 10 mili volt and 4 to 20 mili volt as per customer application. This system is also can attached with PLC or SKADA software.